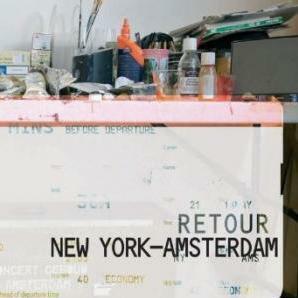 The book: Retour New York-Amsterdam: a photo book portraying 16 artists. Eight American artists living and working in Amsterdam and vice versa for the eight Dutch artists. The artists are photographed in their studios and together with their art. Sandi, the curator, started the research on these uprooted artists when she sensed the effect that change of place was having on her own work. The bilingual text tells their stories and the influence of their new-found cities. Written and photographed by Sacha de Boer, news personality and photographer. Published by Atlas. The exhibit: The exhibit, Retour New York Amsterdam, was a creative form of bringing the book alive on the walls and in the salons and rooms of Huize Frankendael. Each artist selected a work special for this exhibit. The artists: Charlotte Dumas, Jimmy Rage, Helen Verhoeven, David Lindberg, Liselot van der Heijden, Charlie Citron, Elise Tak, Eddie Woods, Sebastiaan Bremer, Heather Jeltes-Davis, Leo de Goede, Karen Birnholz, Sjoerd Doting Betsey Green, Hans Broek, Renee Ridgway. Art dinner: During the exhibit two intimate dinners took place in the Grand Salon at Huize Frankedndael. The artists chosen for these events were; Charlotte Dumas and Helen Verhoeven. Both evenings were unique, the women spoke of what inspires their work as well as giving a small presentation. The menus were selected by the artists. NY presentation at CLIC: After a successful debut in the Netherlands, the roundtrip was complete with a book launch and signing at Clic bookstore/gallery on Centre Street in NYC. The event was well attended with book signings by the authors as well as many of the artists. RTL Boulevard, filmed an interview with Sacha during the event.